When you stop into Columbus Brothers at 3525 Lebanon Church Road in West Mifflin, just mention the "Free Upgrade" to one of our sales representatives and you will recive a free deluxe upgrade on your Merillat kitchen cabinets! 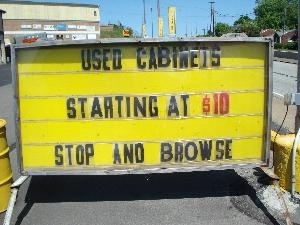 Previously enjoyed cabinets; great for cabins, garages, and basements starting at $10 and up. Also stop in and check out some of our other great offers on items such as countertops, lighting fixtures, and other unique items. 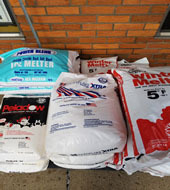 We have 50 pound bags of Rock salt, Calcium Flakes and Pellets, and a "Power Blend" that is a mix of both!